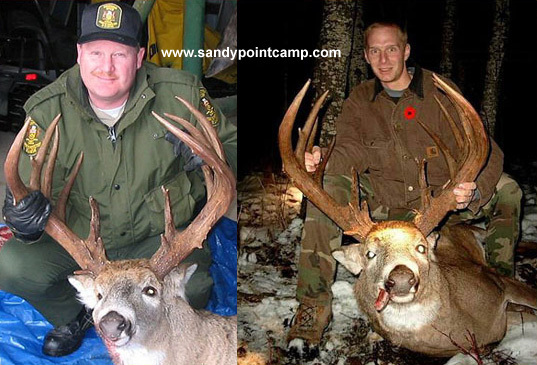 Northwestern Ontario has become the center of attention for deer hunters that are really serious about harvesting a huge trophy Whitetail Deer. In the last few years, as deer hunting in the area is getting more popular, giant trophy bucks of unusual size have been harvested. There have been a few deer in the last couple of years, which have been just a couple of B&C points below Milo Hansen's world record Whitetail, but still have gained international recognition. An area that starts at Sioux Narrows, then up to Dryden and across to the town of Ignace, has been recognized for world class bucks and has been called the Whitetail Triangle by the newspapers and hunting magazines. 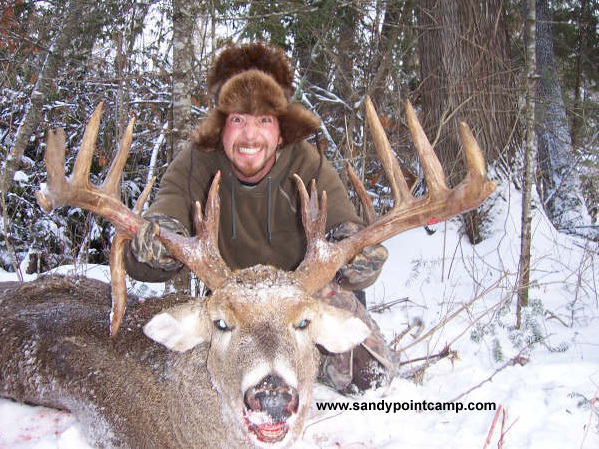 Sandy Point Camp is located in WMU 9A, which is the northeast section of this hot deer hunting location. Our deer hunt takes place on private land and public land, which is also called Crown Land. 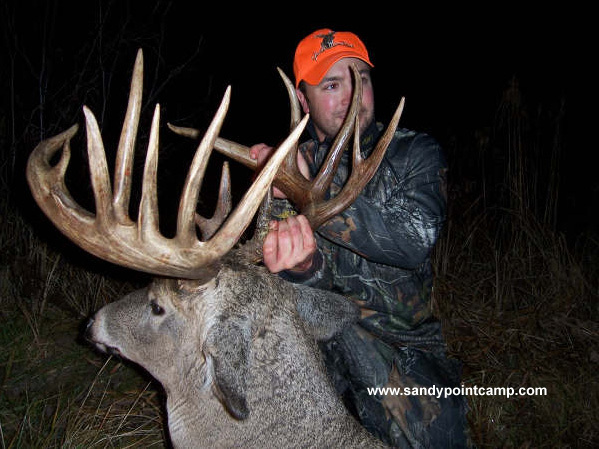 Our hunting area contains a growing herd of whitetails but overall populations are still moderate compared to some prime habitat located in the U.S. Sandy Point Camp hunters should not have expectations of seeing herds of deer, but should come with expectations of harvesting a true trophy class animal. Access is generally easy but there are some remote spots that take some effort. We have many opportunities and methods for hunting including stand hunting, (tree or ground blinds), still hunting clearcuts, or setup on travel corridors. Due to liability issues with our insurance company, we do not supply tree stands, but encourage our hunters to bring their own. We offer our deer hunters warm and cozy lakeside cabins and other conveniences, which are listed on the Deer Hunting Details page. Ontario Deer Hunting News: Some unusually hard winters in 2012 and 2013 and the over population of wolves has effected the Whitetail Deer population in Northwestern Ontario. The really big bucks are still present but the overall population of deer is lower. Some areas far west of our location have seen a major decline in deer populations. Since the spring of 2014 the deer population has been rebounding due to a massive increase in wolf hunting.